I don’t imaging those on the plantation will notice or even care. People see this . It is deeply resented by the laid off government employees. The President is on such high ground here that you cannot make it up. We are winning. BUILD THAT WALL Mr. President!! Mel is keeping his teenage trafficked hookers out of sight?? Although the article kind of implies this, I surmise that vacationing Democratic lawmakers are still receiving their paychecks. Wouldn’t even pay a nickel. That’s what you call a smoked ham right there. I am so glad they are concerned about the federal workers. Well, you have obviously never been shipwrecked for years on a deserted island like this poor Senator. The legislature is a separate branch of government. I assume that also means congressional staffers are also paid. The “government workers” (All executive branch!) not being paid are the ones with the least to say or effect it. "People see this . It is deeply resented by the laid off government employees. The President is on such high ground here that you cannot make it up. We are winning. BUILD THAT WALL Mr. President!!" But how many people will ever read or see any of this? Gateway Pundit is not a big MSM source and I would be surprised if the majors cover any of this. Maybe Trump could tweet about this and enclose the picture? Senator should allow a Senate recess so that President Trump can make a single recess appointment before his term expires—so who is working and who cares moment. The art of hard work for the political class is a mirage. Every day without a recess appointment is a day without sunshine. Some kind soul should explain to that woman that time and gravity are NOT her friends. 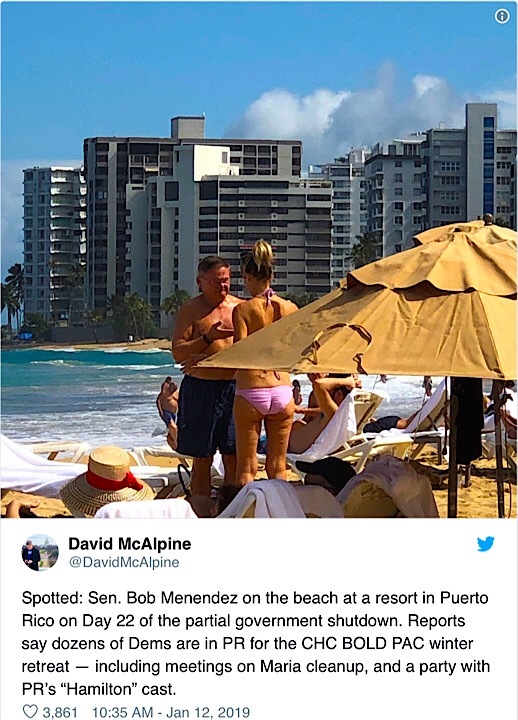 I read somewhere last night that the purpose of the trip was for the Dems to meet with PR’s governor to try to assess the need for additional “assistance” from the U.S. for lingering damage done by Hurricane Maria. The implication in the article was that this would be telegraphed as another of Trump’s “failures”. In fact if memory serves, it was the Puerto Rican unions and government who at the time of the storm prevented U.S. ships loaded with emergency supplies from docking at the ports—and that this was done to embarrass Trump. I’m sure they feel their pain. Some of them need to vacation somewhere where they can’t be extradited. Nancy Pelosi has gone AWOL. It’s hard to think of a better time for Trump to sign an Executive Order to build the Wall than now when Nancy is out of the country partying. She’d probably be unable to respond coherently for hours, having joined in the Democrats’ revels. In fact, if she couldn’t respond to Trump’s critical announcement within fifteen minutes, the news that she was out of the country partying would go viral over the news media.